The photo above is of a typical DB7 Vantage in stock form. 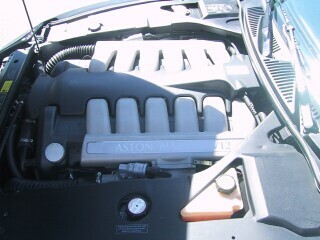 This is the V12 DB7 model from Aston Martin. This is basically the same engine as the Vanquish but slightly detuned (or perhaps I should say, just not tuned as high) to 420HP. It has dual overhead cams and 48 valves and is 6.0L displacement. We (Polk Performance) installed twin turbochargers. I estimated that we should be able to get around 550HP at the crank with just 5psi boost. This car uses 2 Ford EEC-V PCM's, one for each bank. They operate in a master/slave configuration. 4-2005: Polk Performance made log style exhaust manifolds and did the custom turbo install. Here are a few pictures of the progress so far. 6-2005: I temporarily installed the IAC's and Brian Young successfully reflashed both PCM's using the Superchips Custom Tuning package. We realized that we need to install ACT's in each bank after the turbo's so we are working on that now. We also have some other vacuum plumbing issues to clean up. I drove the car just on my street (slow speeds) and it seems to respond real well. Once we get the ACT's installed and wired in, we will be ready for dyno and driveability tuning..
We could not find room for intercooling. One possibility is to use Laminova intercooler cores inside the factory manifolds. The intent is to keep it all emission legal. 2006: This car is completed now. It is currently set at only 5psi boost so power at the wheels is 480HP and 480ft*lbs of torque. 11-2008: The owner is selling this car. The price is $50k or best offer.